I wrote this three years ago and shared it on the Kindred Community, as part of a series of posts celebrating the Sacred Family. I was looking for some of my writing on parenting and found this, realising I hadn’t put it on my blog. Three years later, here it is! Here are the thoughts on birthing and pain that I had before my third child was born. And interestingly … about that comment I made about labour being a predictable pattern? Well it looks like you can’t even count on that … this child did not even allow me the time to indulge in labour. Hers was a cold birth. …. I tell you she really did lead me down the dark passage of grace – and what a shining light she has become! I am preparing for the birth of our third baby … soon. Thoughts about preparing for this birth are never far from my mind at the moment. Reflections on my past two births are also coming up and thoughts about the pain of birthing are surfacing too. I was writing an email to a friend a while ago, who was asking for some resources that will help her prepare for the birth of her first child. After listing a few of the resources that helped me greatly in my previous two births, and in the recovery from my miscarriage in between – I then found myself writing on to address the issue of fear of pain in birth. I think I may have garbled on a bit as I tend to do, but one remark I made in my email brought tears to my own eyes: I said that although I will always have certain concerns and worries about birth they are nothing in comparison to my experiences as a parent. Labour is a breeze. I don’t think anything really prepares you for parenting – and indeed it can be a shock for first time parents. But I think that is part of what birth IS – the process of birthing is preparation for what is yet to come … it is the birth of a new phase in your life, a new role, a new you. I would take labour over waiting in a hospital emergency room with a sick child any day. At least with labour you know what will happen, well, kind of, as labour almost always progresses to a certain pattern. With a child’s illness you do not have this certainty. There is nothing quite like the tension and anxiety of waiting to find out if your child is going to be ok – or if they will make it through the night without further complications. We had that frightening experience as new parents when we waited to find out if our baby would survive the night without severe brain damage, at the beginning of a sudden and very serious childhood illness. It wasn’t fair. Labour was a relaxing meditation in comparison to the pain of that experience. The times I cried when learning to breastfeed, the times when I’ve stayed awake all night nursing my children through fevers, vomiting, asthma or nightmares, the times we’ve visited hospital for accidents and illnesses, the times I’ve been ill and have STILL had to be a responsible parent, the times when our children’s behaviour is just too intense and challenging and confusing, the time when we found out our son is deaf … each time we experienced something like this I distinctly remember this thought popping into my mind: I’d rather be in labour! Labour is easy compared to the torture of on-going sleep deprivation, the agony of listening to your child’s struggle for oxygen during an asthma attack!! It is easier than knowing that parenting goes on and keeps presenting you with new challenges and you just have to learn how to move through the moments of uncertainty so that you can get back to loving and savouring every second of the joyful ones, which are far more common, even if the effects of the painful ones are long-lasting and bitter-tasting. Bitter foods awaken and enliven our digestive system. Bitter experiences awaken our ability to digest our life experiences. I am painting a grim picture of the experiences of parenting! Like labour, these things pass into memory and labour prepares us for this. I love being a parent. I love my family and the colourful life they present me with. They’ve taught me that downhill runs and plateaus are so much more enjoyable and satisfying because you’ve had to slog it up the steep hill in the first place. I am grateful that my experiences of birth and parenting have allowed me to know what it is like to confront the scary face of the unknown, and move through it, maybe not always with confidence, but with the idea that if you just keep moving forward one step at a time embracing the unknown, then whatever happens next is much easier to accept. You’ve done what you could to prepare. You’ve done what you can to heal the situation – and the rest you hand over to trust and faith. THAT is the hard bit. To be honest, pain in childbirth is never what you think it will be; certainly not if you are prepared to accept that it is going to hurt, knowing WHY it hurts. It is different every time, and for different reasons. Pain in labour happens because your body is changing shape in a matter of hours to let your baby out – it is a GOOD thing! It is a great skill to know how to then transform that experience into a power you can use, and recall how pain teaches us something new about ourselves. I am much stronger for the experiences I have had, through labour and beyond, and it has opened up parts of me that I couldn’t have accessed before. I posted a quote on my personal blog from Rumi a few weeks ago, on the topic of pain. He wasn’t referring specifically to childbirth I think, even though he uses it as a metaphor, but all the same I think it applies. I am looking forward to the growth I’ll surely experience after this coming labour. That isn’t to say I’m not wary of the pain!! Of course I am, that is human nature, but I know it will pass and I’ll be ok. I am looking forward to opening the dark passage of Grace. 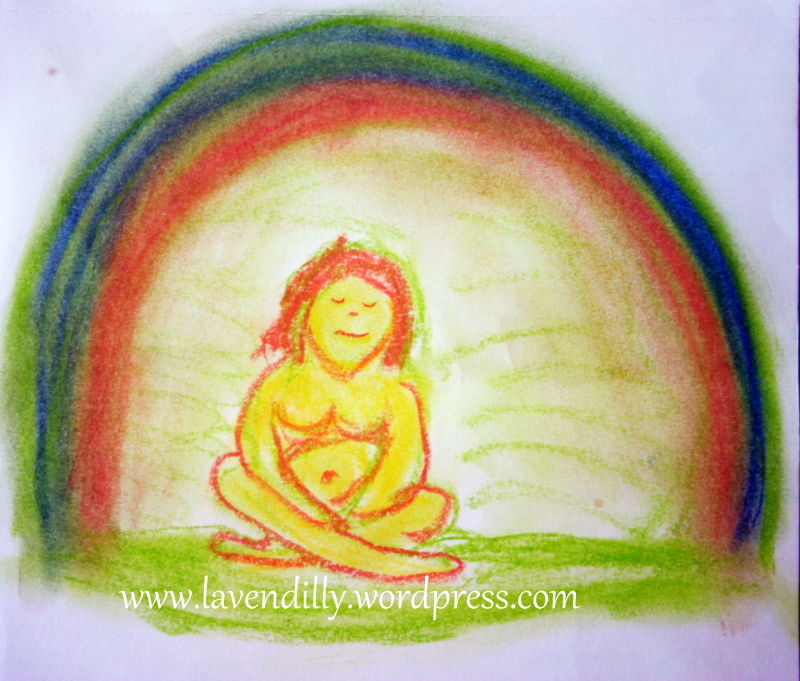 Lavendilly House: Celebrating sacredness and beauty in everyday life. What a wonderfully reflective post. And I feel very similarly about labour, it is just the start of the journey. An incredible experience in itself but often overly focussed on, when the longer more challenging but also amazing journey of parenthood follows. this is a really great post. some of my friends had emergency c-sections and fretted that they hadn’t given birth properly. I tried to reassure then that the important bit was yet to come. I think you have put that so eloquently here. I’d love you to consider adding this to the Sunday parenting party link up a have over at tamingthegoblin.com I think or readers would really appreciate the thoughtfulness of this post. Thank you for your kind words. I have seen Taming the Goblin in the past, and I have just linked up on your Sunday Parenting Party… thank you for the invitation, there are many fabulous blog posts there. Thank you very much. I’m always very touched when I write something that resonates with other people.